Alan Turing was one of the twentieth century's most influential mathematicians. He's regarded as the father of modern computer science, played a vital part in breaking the Germans' Enigma code during WW2, fundamental to the Allied victory, and his work in mathematical logic penetrated to the very foundations of maths. Arguably, his work has touched more lives than that of most other mathematicians. Alan Turing, 1912 - 1954. But sadly, almost nothing tangible remains of the Bletchley Park codebreaker's work. So when an extremely rare collection of papers relating to his life and work was set to go to auction last year, an ambitious campaign was launched to raise funds to purchase them for the Bletchley Park Trust and its Museum. The Trust has announced today that the collection has been saved for the nation as the National Heritage Memorial Fund (NHMF) has stepped in quickly to provide £213,437, the final piece of funding required. The campaign was launched by passionate supporter Gareth Halfacree, and attracted colossal public and media backing, with £28,500 donated by hundreds of members of the public within just eleven days. Google has generously pledged $100,000 and a significant sum has been received from a private donor. Despite this tremendous support, further funds were needed to reach the asking price and prevent the collection from potentially being bought by an overseas collector, threatening this unique piece of national codebreaking and computing heritage. Dame Jenny Abramsky, Chair of the NHMF, said: "This is such welcome news. Alan Turing was a true war hero and played an absolutely crucial role during the Second World War. The National Heritage Memorial Fund was set up in memory of those who have given their lives for the UK and this grant will now ensure that this extremely rare collection of his work stands as a permanent memorial to the man and to all those who paid the ultimate price in service to this nation." Peter Barron, Director of External Relations for Google, said, "Turing is a hero to many of us at Google for his pioneering work on algorithms and the development of computer science. We're delighted that this important Collection will now be accessible to everyone visiting Bletchley Park." The collection of articles belonged to Professor Max Newman, Turing's friend and fellow Bletchley Park codebreaker. It includes offprints of sixteen of Turing's eighteen published works including his momentous paper On computable numbers. A limited number of the offprints would have been produced at the time and Turing's giving them to Newman bears testimony to their unique relationship. The set includes articles which have been annotated by Newman, along with Max Newman's name inscribed in pencil in Turing's hand. Accompanying the set of offprints is the Newman household visitors' book with several signatures of Turing, that of Turing's mother and, of special significance to Bletchley Park, signatures of other wartime codebreakers. The Turing-Newman collaboration collection is particularly rare, important and valuable as very few physical traces of Turing's work or personal belongings still exist. Most of the wartime records at Bletchley Park were destroyed after the war, while Turing himself kept little of his work and very few personal belongings. Turing's close relationship with Newman was crucial to the historic contribution Turing made, starting with Newman's encouragement to investigate what he called "mechanical processes" and his help in securing Turing a fellowship at Princeton to continue his research. In 1952 at a time when homosexuality was illegal in the UK, Turing was convicted of having a sexual relationship with another man. 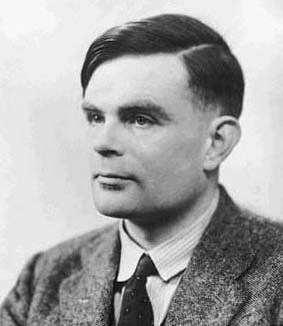 Turing was sentenced to a hormone treatment that amounted to chemical castration. The conviction robbed him of his security clearance for the Government Communications Head Quarter, for which he still worked, and made him the target for surveillance at the start of the cold war. Having made one of the most outstanding contributions of the twentieth century, he died after eating an apple laced with cyanide. In September 2009, following a public campaign, the then Prime Minister Gordon Brown issued an unequivocal and powerful apology for the way in which Turing had been treated, saying "on behalf of the British government, and all those who live freely thanks to Alan's work I am very proud to say: we're sorry, you deserved so much better". Historians agree that Bletchley Park, top secret codebreaking hub of World War Two, shortened the war by at least two years saving countless lives. Since 1994, it has been open to the public as a museum. Simon Greenish, CEO of the Bletchley Park Trust, welcomed today's announcement, saying, "The acquisition of this hugely important collection has been made possible only by the astonishing support demonstrated by the public, the media, Google, the National Heritage Memorial Fund and Christies the auctioneers whose help in brokering the purchase is gratefully acknowledged. We are delighted to have the collection here at Bletchley Park, which is surely its most fitting home, and it will be an incredible addition to the visitor experience." Tourism and Heritage Minister John Penrose said, "Safeguarding our heritage isn’t just about bricks and mortar or fine art, it's also about preserving the evidence of significant scientific discoveries and inventions. The National Heritage Memorial Fund's grant to the Bletchley Park Trust to help secure this collection for the Trust is fantastic news and reflects the great advances Turing made in terms of code breaking and computer science, which as we now recognise, helped to turn the tide for this country during the war." You can have a genuine WW2 Enigma machine visit your school with our sister project Enigma.